Following deliveries into Mace sites within London we came across FORS, as part of our contractual requirements.Spence Transport Ltd is a family run haulage company that has been supplying distribution services to our customers for nearly 50 years. 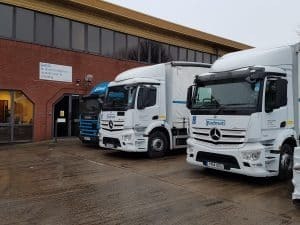 We have just moved into new warehouse facilities in Staines upon Thames which has great transport links into London which benefits all our customers. Anthony Spence, Director, explains how Spence Transport Ltd has achieved increased performance and seen significant reductions in fuel consumption, through FORS. We started to investigate FORS membership in July 2013 we successfully completed our Bronze audit, Since achieving FORS Bronze we have seen much improvement in all of our processes within the company. Once we became a FORS accredited company we took advantage of all the great benefits available to all members via the website there are great savings on equipment and services. FORS has improved the way we look at driver training and vehicle safety which has always been a priority but with FORS training programs we have seen a big improvement within the company. After we successfully completed the Silver audit we decided to start putting everything in place to upgrade our membership to Gold which we completed In February 2015. One of the main reasons for progression to Gold was policies, training and operating procedures which FORS has been extremely helpful supplying us with training online and in class. This year we introduced the new RAM tracking system with which we have been able to monitor driving behaviour, routing and any unnecessary or extended idling more closely. Any excessive idling the system actually flags this up to the traffic office with details of vehicle, driver and idling time, as you can see from the chart below this has had a significant impact on unnecessary fuel wastage. All Drivers are subject to a Fitness Review and eyesight check, on an annual basis, as well as a DVLA check of their licence details to ensure all our drivers remain safe to drive and protect the public. We do not use agencies for recruitment or use agency drivers, most of our drivers have been recommended by our own employees or recommended by other companies we are associated with. We have introduced a new noise policy the purpose of this policy is to keep noise levels to a minimum when driving, loading and unloading and to ensure that all equipment on the vehicle is in good working order and maintained to minimise noise levels when in use. We will ensure that all employees are briefed and understand this policy. We are continually investing in our Fleet and have already replaced 4 of our 7 vehicles to Euro VI to keep it as new and up to date as possible with the latest in cab technology to aid drivers in their daily roles. Modal shift and alternative vehicles is something to consider in the future. We are a relatively small family business and moving part or all of our consignment is not financially or practically possible due to the nature of our work. However, this will be reviewed as technology becomes more affordable. FORS has been extremely beneficial to our company and also our customers (it has also allowed us to widen our customer base). Achieving FORS Gold represents a great achievement within our company and would enable us to carry on improving our quality and safety standards.